AROUND 300 pagan worshippers braved freezing temperatures to celebrate the winter solstice at Stonehenge, but turned up on the wrong day. Dressed in traditional robes, they met at the stone circle on Monday to mark the rising of the sun on the shortest day of the year, but got their calculations wrong. The winter solstice occurs when the tilt of the Earth’s axis is at its furthest from the Sun, resulting in the fewest hours of sunlight of the year. 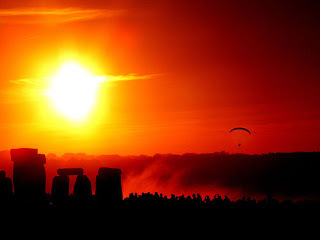 Although it normally falls on December 21, the exact time of the solstice varies each year and this year the solstice was 5.47pm on Monday so, because the sun had already set, the official celebrations took place at sunrise on Tuesday. But the hundreds of enthusiastic worshippers who turned up a day early went ahead and celebrated anyway. English Heritage, which manages the site, decided to open the gates and welcome them even though it was the wrong day. Hundreds more pagans and druids turned up on Tuesday morning for the official winter solstice celebrations.